Question #1: The Whey to Celebrate Shavuos! Each of the above questions is a shaylah that I have been actually asked, and each involves our understanding the prohibition created by Chazal against making dairy or meaty bread. In a previous article, we learned that it is prohibited to use milk as an ingredient in dough, and that if one added milk to dough, the bread produced is prohibited from being eaten at all, even with a dairy meal, because of concern that one may mistakenly eat the dairy bread together with meat. The Gemara rules the same regarding baking bread that contains meat ingredients or baking on a hearth that was greased with beef fat – it is prohibited to eat this bread, even as a corned beef sandwich (Pesachim 30a, 36a; Bava Metzia 91a; Zevachim 95b). If one greased a hearth with beef fat, one must kasher it properly before one uses it to bake bread. Is one ever permitted to make dairy bread? In the previous article, I noted that Chazal did not prohibit producing small quantities of milchig or fleishig bread. What was not discussed was: how much milchig or fleishig bread is considered a “small quantity” that one may produce? One early authority, the Hagahos Shaarei Dura, rules that one may bake rolls that have absorbed meat for Shabbos meals, since they will certainly be eaten in the course of Shabbos. Although both the Shulchan Aruch and the Rama quote this ruling of the Hagahos Shaarei Dura, a careful reading of their comments shows that these two authorities dispute exactly how much one may make. The Shulchan Aruch (Yoreh Deah 97:1) writes that a small amount is the amount that one would eat at one time, which implies that it is permitted to make only what one would eat at one sitting and not leave any leftovers (Pri Megadim, Sifsei Daas 97:1; Ben Ish Chai, II Shlach 17; Darchei Teshuvah 97:17; Badei HaShulchan, Tziyunim #49). Thus, when preparing dairy or meat bread, one may make only as much as one is certain that his family and guests will completely devour at the time the bread is served. On the other hand, the Rama rules that one may make milchig bread for Shavuos or fleishig bread for Shabbos, since this is called a “small amount.” When preparing bread for Shavuos or Shabbos, one is preparing more than what will be eaten at one sitting, but what will be eaten for a whole day. In another venue, the Rama states explicitly that it is permitted to make dairy or meat bread for a day at a time (Toras Chatas, 60:2). For this reason, the Aruch HaShulchan concludes that one may knead dough that is no more than what one’s family and guests will eat within 24 hours. We should note that although several authorities mention explicitly that the Shulchan Aruch and the Rama dispute whether one may make bread for only one sitting or for one entire day, other authorities imply that the Shulchan Aruch accepts the Rama’s more lenient understanding of a small amount (see Chavos Da’as, Biurim #4; Aruch HaShulchan 97:4). All opinions agree that one must be careful not to produce so much that one expects there to be leftovers, unless one makes a heker in the bread (Bach; Darchei Teshuvah 97:34). The whey to celebrate Shavuos! The answer is that, according to the Rama, one may prepare milchig bread in honor of the day, but only as much as will definitely be eaten in one day’s time. According to the way most authorities understand the Shulchan Aruch, a Sefardi should not prepare more than will definitely be eaten in one meal. I have not found any halachic authority who states that the custom not to eat meat during the Nine Days permits us to make dairy bread during these days. Perhaps the reason why no one mentions such a heter is because there are numerous situations when one may eat meat, such as when a person is ill, at a seudas mitzvah, or on Shabbos, and we still need to be concerned that one may mistakenly eat the dairy bread on one of these occasions. However, the two general heterim mentioned above, either of preparing a small amount of bread or of making bread with an unusual shape, both apply. Therefore, if the questioner is a Sefardi who follows the Shulchan Aruch, he may make (without a heker) as much dairy bread as his family and guests would eat at one meal without any leftovers. If the questioner is an Ashkenazi, he may make as much dairy bread as his family and guests would eat in a 24 hour day, without having any leftovers. 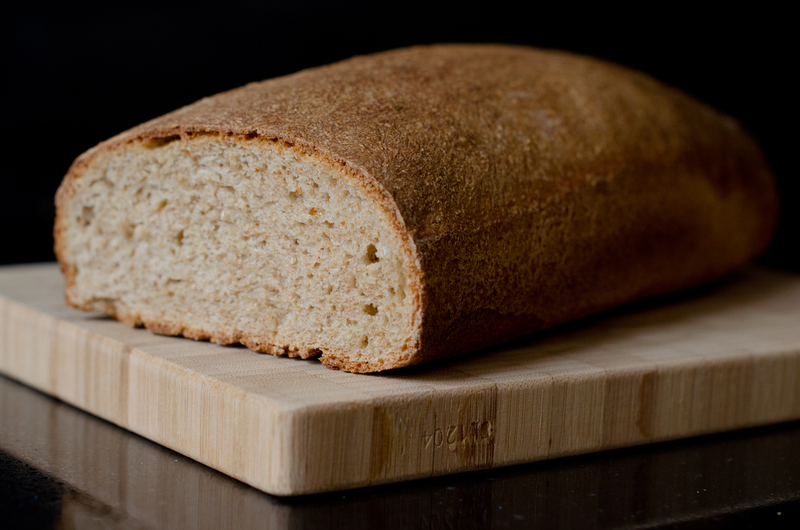 The halachic authorities discuss whether the prohibition against bread containing dairy or meat applies also to items such as spices and pastry. The consensus is that one may add dairy ingredients to pastry that is ordinarily not eaten with meat, but is usually eaten either as dessert or together with coffee, but that one may not add dairy ingredients to foods, such as crackers or zwieback, that sometimes are eaten to accompany meat (Shu’t Maharit 2:18; Chachmas Adam 50:3). Others are lenient even regarding crackers and zwieback, contending that Chazal prohibited only regular bread (She’eilas Yaavetz #62; see Pri Chodosh, Yoreh Deah 97:1). According to both of these opinions, one may produce dairy cakes, cookies or doughnuts, even if they do not obviously look dairy. There is a minority, late opinion that disagrees with the above and contends that one may not make dairy products that one may mistakenly eat for dessert after a meat meal (Yad Yehudah, Peirush HaKatzar 97:3). Following this approach, all dairy cakes, cookies or doughnuts must either be obviously dairy or be marked in a unique way that calls attention to their dairy status. Based on this latter approach, common custom in Eretz Yisrael today is to make cheese bourekas in a triangular shape and pareve bourekas in square shapes. One could argue that since bourekas occasionally accompany meat, they should be prohibited from being dairy, even according to the opinions of the Shu’t Maharit and the Chachmas Adam, whom I quoted above. Since many authorities consider the Chachmas Adam to be the final authority in kashrus and other yoreh deah topics, this forms the basis for the current custom in Eretz Yisrael. What if it happened by mistake? What is the law if someone is in the process of making dough, and some milk spills into the dough? Is there a basis to be lenient, since the person was not trying to violate Chazal’s rules? The answer is that the prohibition against eating dairy bread is not a penalty that Chazal imposed on someone who violated their ruling. It is a takkanah that they instituted to ascertain that no one err and mistakenly violate the laws of eating meat and milk together. Thus, the prohibition is in effect, whether or not the milk (or meat) was added intentionally or in error. When there was an unintended spill of meat or dairy and a major loss will result, the Chachmas Adam (50:5) permits giving many families one loaf of bread each for immediate consumption (see also Aruch HaShulchan, Yoreh Deah 97:8; Yad Yehudah, Peirush HaKatzar 97:4). This is permitted, because each person receives an amount that he will finish in one day. There are authorities who permit a commercial bakery to manufacture a large quantity of dairy bread, as long as it is careful to sell to each individual or household only a small amount that he would be permitted to make for himself (Shu’t Kesav Sofer, Yoreh Deah #61). This logic would permit a kashrus agency to certify a company that makes dairy bread (under permitted conditions), even though they are making a large dough. However, an earlier authority, the Maharit, rejects this heter, as he is concerned that the baker may forget to tell customers that the bread is dairy (Shu’t Maharit 2:18). Does the prohibition apply only to a Jewish bakery, or even to a non-Jewish bakery? Chazal have the ability to prohibit only Jews from specific activities, but there is no mitzvah binding on a gentile to obey a ruling of Chazal. Thus, the question is as follows: If a gentile-owned bakery produces commercial quantities of dairy bread, may a Jew purchase small amounts of this bread — that is, enough for one meal or for one day? The Yad Yehudah (Peirush HaKatzar 97:7) discusses this issue, and prohibits it, only because of the problem of chalav akum, milk that was not supervised by an observant Jew. (I have written several articles on this topic in the past, and they can be accessed on RabbiKaganoff.com under the headings “milk” or “cheese.” Alternatively, I can send it to you in an e-mail.) According to those who permit contemporary produced milk, it would appear that one would be permitted to buy a small quantity of dairy bread – enough that one would consume either at one meal or in the course of one day, without any leftovers. The Gemara teaches that the rabbinic laws are dearer to Hashem than are the Torah laws. In this context, we understand the importance of this prohibition created by Chazal to protect the Jewish people from eating dairy and meat together. We should always hope and pray that the food we eat fulfills all the halachos that the Torah commands us. The menu of what Avraham served his guests included both dairy and meat, provided an opportunity to discuss the question concerning whether one may prepare milchig bread. Question #2: No pareve bread in sight! Each of the above actual questions involves our understanding the prohibition created by Chazal against making bread containing either dairy or meat ingredients. In several places, the Gemara quotes a beraisa that prohibits using milk as an ingredient in dough, and states further that, if one added milk to dough, the bread produced is prohibited from being eaten at all, even as a cheese sandwich. This rabbinic injunction is because of concern that one might mistakenly eat the dairy bread together with meat. The Gemara rules the same regarding baking bread directly on an oven hearth that was greased with kosher beef fat – it is prohibited to eat this bread, even as part of a corned beef sandwich (Pesachim 30a, 36a; Bava Metzia 91a; Zevachim 95b). If one greased a hearth with beef fat, one must kasher it properly before one uses it to bake bread. Is one ever permitted to make dairy or meaty bread? What does the Gemara mean when it permits dairy or meaty bread made like “a bull’s eye?” Does this mean that some bakers double as excellent sharpshooters? We find a dispute among early Rishonim as to what the Gemara means when it says that one can prepare a dough like a bull’s eye. Rashi explains it to mean that it is the size of a bull’s eye — one may bake a small amount of dairy or meaty bread that one would eat quickly. Since there will be no leftovers, we are not concerned that one may mistakenly use the dairy bread for a corned-beef sandwich or spread cream cheese on the fleishig bread. Other authorities explain that this refers to the shape of the dough. The Gemara means that if one shaped the dough like a bull’s eye or some other unusual shape, the heker (here, distinguishable appearance) accomplishes that no one will mistakenly eat it with meat or dairy (Rif, Chullin 38a in his pages; Rambam, Maachalos Asuros 9:22). Although these are clearly two different ways of explaining the Gemara, the authorities conclude that there is no dispute in halachah between these two approaches (Hagahos Shaarei Dura, quoted by Beis Yosef, Yoreh Deah 97; Shulchan Aruch ad loc.). In other words, although in general one may not make dairy or meat bread because of the above-mentioned concerns, one may prepare a small amount of dairy or meaty bread. One is also permitted to make dairy or meaty bread with an unusual shape. The Maharit, one of the great halachic authorities of sixteenth-century Israel, discussed the following situation: A specific town was located at quite a distance from any source of vegetable oil. As a result, vegetable cooking oil was expensive, and the townspeople, therefore, used beef tallow for all their baking, cooking and frying. (Apparently, the local cardiologist felt that the populace had a cholesterol deficiency – no doubt because they observed the Mediterranean Diet.) Indeed, the people in town always treated their bread as fleishig, since they assumed that it always included beef fat as an ingredient. The Maharit first discussed whether this provided sufficient reason to permit consuming local bread in this town. Does the fact that all local residents know that their bread is fleishig preempt the takkanas chachamim prohibiting production of meaty bread? The Maharit questioned whether this is sufficient reason to be lenient, since we still need to be concerned about visitors from out of town who are unaware that the local bread is fleishig. Indeed, some visitors had eaten local bread with cheese, not realizing that it contained a meat product. The Maharit concluded that local circumstances are insufficient grounds to permit fleishig bread – and that the local bread is permitted to be eaten only if it has a heker, or only if people make small quantities of bread (Shu’t Maharit 2:18). This means that commercially-made bread in this town would be made exclusively with unusual shapes. However, a later authority disputed this conclusion of the Maharit. Rav Yonasan Eibeschutz, in his commentary on Shulchan Aruch Yoreh Deah (Kereisi 97:2), mentions that in his town and environs all the white bread was made with milk, and the accepted custom was to bake, purchase and use even large quantities of the bread without any heker. He notes that, according to the Maharit, this bread is prohibited, yet he concludes that, notwithstanding the Maharit’s opinion to the contrary, the bread is permitted, since everyone knows that the local bread is dairy and no baker in town produces pareve bread. He closes by mentioning that someone who is G-d fearing should not use the local dairy bread, although it is technically permitted. Thus, whether one may permit milchig bread because all local bread is always milchig, or one may permit fleishig bread because all local bread is always fleishig is a dispute among prominent authorities. A later authority, the Kesav Sofer, permitted a commercial bakery to produce milchig or fleishig bread, provided that the bakery sold only a small amount of bread to each customer. He contended that since the consumer only owns a small quantity of bread, we are not concerned how much the bakery actually produced. In this context, I would like to share an anecdote. Many years ago, I was posed a question by a rav living in a small community that had no kosher bakery. He had the opportunity to provide a hechsher to a non-Jewish-owned bakery, which in his community would be very advantageous, since he would not need to be concerned about the bakery being open on Shabbos or on Pesach, or about hafrashas challah (all issues that I have discussed in other articles). The owner of the bakery was willing to meet all the ingredient requirements of the hechsher, and, in addition, was located within walking distance of the frum community, so that random inspections could take place even on Shabbos. The question germane to our topic was that the baker baked his white bread with milk, and the rav was uncertain whether and how to proceed with providing a hechsher to this bakery. According to the above-quoted Kesav Sofer, the rav could even provide a hechsher on the entire bakery, including the bread, and instruct people that they may purchase the milchig bread only in small quantities that would be eaten within a day. However, according to the Maharit, the dairy bread should be treated as non-kosher. The rav’s decision was that the hechsher sign in the bakery would list which pastry items in the bakery are supervised as kosher/dairy, and which pastry and bread items are certified kosher/pareve, and that the sign would imply that the bakery sells breads that are not certified kosher because they are dairy. In this approach, he followed common custom not to rely on the Kesav Sofer’s leniency. I mentioned above that one may make dairy or meat bread if it has an unusual shape. How unusual must the shape be? As we can imagine, we are not the first to ask this question. In his above-mentioned responsum, the Maharit discusses what type of heker the halachah requires. He notes that there are two ways to explain what the heker accomplishes. One possibility is that the heker is so that people who know the bread is fleishig won’t forget and mistakenly eat it with cheese. The second possibility is that the heker is necessary so that people from outside the area, who are unfamiliar with the fact that the bread is fleishig, will stop and ask why is this bread different from all the other bread in the rest of the world. In other words, according to the second approach, the heker must be sufficient to draw people’s attention to it, so that they ask why this bread looks so strange. This approach of the Tur is quoted by a later authority, when the Rama (in Toras Chatas 60:2) states that the heker is so that one does not forget that he made milchig or fleishig bread. Why is this bread so different from all other breads? The Maharit notes that a difference in halachah results from this dispute between the Tur and the Rashba concerning whether an item with a minor heker can be sold. If the reason is so that people will ask, there would need to be a major heker. Otherwise, one would not be permitted to make the bread. If the reason for a heker is to remind people that this bread was made dairy, a minor heker will suffice, as long as these breads are not sold, since visitors will eat them as guests in the houses of people who will know to serve them only with fleishig meals. In a different ruling, the Rama again demonstrates that the heker is so that someone not forget that the bread he made is dairy. The Rama rules that one may make challohs for Shavuos with dairy ingredients, since the challohs for Shavuos are shaped long whereas the regular Shabbos and Yom Tov challohs are round. According to the approach of the Rashba, this difference in shape would not suffice, since someone visiting would not ask why the challohs are shaped long, and would not notice anything unusual to attract his attention. However, according to the Tur, who holds that the heker is so that one not forget, this difference in shaping is sufficient. We have thus learned some of the laws of producing dairy and meaty breads. Stay tuned for the continuation of this article, as we continue exploring this meaty topic!! May I Take a Nice Hot Shower on Yom Tov? “Beis Shammai says, ‘One should not heat water for washing one’s feet on Yom Tov unless it is appropriate for drinking, whereas Beis Hillel permit this. One may kindle a bonfire to warm oneself” (Beitzah 21b). The Mishnah implies that both Beis Hillel and Beis Shammai forbid heating water on Yom Tov to bathe one’s entire body, and dispute only whether one may heat water to wash one’s feet. Beis Shammai rules that one may heat water on Yom Tov only for food purposes – to cook or to heat drinking water. In their opinion, if one needs to heat water on Yom Tov for washing, there is only one way: Prior to heating drinking or cooking water, one may place more water in the pot than one needs, planning to use the surplus hot water for washing (Tosafos, Beitzah 21b s.v. lo). This action is permitted because of a law called marbeh beshiurim, literally one increases the quantities, which means that, while preparing food on Yom Tov, one may include a greater quantity with one’s action, provided no additional melacha act is performed. Based on this principle, one may place a large pot of water on the fire rather than a small one, since he is performing only one act of heating water. However, this is prohibited if one performs any additional melacha action. Similarly, one may not add extra water to a pot already on the fire, unless he needs more water for cooking purposes. One may not bake on the first day of Yom Tov for the second. However, one may fill a pot with meat on the first day of Yom Tov, even though he needs only one piece for the first day. Similarly, one may boil a large pot of water on the first day, even though he needs only one cup of hot water. On the other hand, under most circumstances one may not bake more than one needs for the day (Beitzah 17a). Why is baking different? The difference is that adding water or meat before putting the pot on the fire simply increases the quantity cooked, but does not increase the number of melacha acts. However, preparing extra bread entails shaping each loaf or roll separately, thus increasing the number of acts performed. Similarly, Beis Shammai rules that one may only add water for washing to the drinking water before the water is placed on the fire, but not afterwards. They strictly forbid heating water exclusively for washing or bathing. On the other hand, Beis Hillel permits heating water even on Yom Tov in order to wash one’s feet. Why may one do this? After all, this is not for food? Beis Hillel’s rationale to permit this is the legal concept called mitoch shehutrah letzorech, hutrah nami shelo letzorech, which means that once the Torah has permitted any specific melacha to prepare food on Yom Tov, one may perform this melacha even for Yom Tov purposes that are not food related (Tosafos, Beitzah 12a s.v. hachi; cf. Rashi). This is why one may carry a machzor to shul on Yom Tov, even in an area without an eiruv. Since one may carry to prepare food, one may carry for a different Yom Tov purpose, such as davening properly or taking the baby for a stroll, even though these activities have nothing to do with food. Similarly, Beis Hillel rules that one may heat water to wash one’s feet on Yom Tov. Although this use is not food related, once one may heat water for cooking, one may also heat water for a different Yom Tov purpose. Why does Beis Shammai disagree with Beis Hillel and prohibit heating water for the purpose of having a bath? Because Beis Shammai rejects the concept of mitoch; in their opinion, one may not perform any melacha on Yom Tov unless it is food preparatory. Indeed, Beis Shammai prohibits carrying on Yom Tov, except for food-related needs (Beitzah 12a). Our practice of carrying on Yom Tov for non-food needs is because we follow Beis Hillel’s opinion that accepts the concept of mitoch. Despite Beis Hillel’s acceptance of mitoch, they forbid heating water on Yom Tov to bathe one’s entire body (Mishnah Beitzah 21b). Why did Beis Hillel prohibit this activity if mitoch permits other Yom Tov activities? The answer to this question involves a fascinating dispute with major practical ramifications. Chazal prohibited bathing in hot water on Shabbos, even if the water was kept hot from before Shabbos, out of concern that bathhouse attendants might heat water on Shabbos, claiming that it had been heated before (Shabbos 40a). This prohibition is called the gezeiras merchatz, literally, the prohibition on the use of a bathhouse, although it is not restricted to bathhouses, but includes almost all instances of bathing in hot water on Shabbos. Similarly, the Mishnah (Shabbos 38b) describes how the residents of Teverya ran a cold water pipe through hot springs so that they could have hot bath water on Yom Tov. The Sages prohibited using this water for bathing, since it was warmed on Yom Tov, notwithstanding the fact that it was heated automatically. The Rambam’s understanding is that Beis Hillel prohibits heating bath water on Yom Tov as an extension of the gezeiras merchatz, even though no Torah violation can possibly result on Yom Tov (Rambam, Hilchos Yom Tov 1:16). In his opinion, Beis Hillel’s prohibition against heating bath water on Yom Tov is rabbinic, whereas according to Beis Shammai it is forbidden min hatorah. Others dispute the Rambam’s conclusion, contending that heating bath water on Yom Tov is a violation min hatorah, even according to Beis Hillel (Tosafos, Beitzah 21b s.v. lo). This approach requires an introduction. Although the concept of mitoch sanctions non-food-preparatory melacha activity on Yom Tov, this authorization is limited to activities that most people appreciate, called shaveh lechol nefesh. However, mitoch does not sanction a benefit that only some people appreciate and others do not (Kesubos 7a). Let me explain why this is so, and then provide some clarifying examples. When the Torah permitted melacha activity on Yom Tov, its words were: However, that which is eaten by all people, only it may be performed. By emphasizing by all (in Hebrew lechol), the Torah implied that only universally appreciated benefits are permitted. However, the Torah did not permit melacha activities not universally enjoyed. A few examples will explain this concept. One may kindle fire on Yom Tov, because that is how people cook. As I explained above, the concept of mitoch authorizes burning wood to heat the house, since everyone appreciates being warm on a cold day (Mishnah Beitzah 21b). However, not everyone enjoys the aromatic fragrance of burning incense; it is not shaveh lechol nefesh. Therefore, one may not kindle incense on Yom Tov (Kesubos 7a). Similarly, many contemporary poskim rule that smoking on Yom Tov desecrates the holiday [see Shulchan Shelomoh, Refuah Vol. 2 pg. 221; Nishmas Avraham, Vol. 1 pg. 278 ] (in addition to the other prohibitions violated for endangering one’s health and that of others). They contend that most people today do not appreciate the pleasures of smoking, and therefore, it is not shaveh lechol nefesh (see also Shaarei Teshuvah 511:5; Bi’ur Halacha 511:4). How does this compare to bathing on Yom Tov? Until fairly recently, frequent bathing was uncommon. Therefore, Tosafos explains that warming bath water is not shaveh lechol nefesh and is therefore proscribed on Yom Tov min hatorah, even according to Beis Hillel. As I explained above, the Rambam disagrees, maintaining that heating bath water is prohibited only miderabbanan, as an extension of the gezeiras merchatz. Thus, these authorities dispute whether heating bath water on Yom Tov is forbidden min hatorah or only miderabbanan. Is there any practical difference between these two opinions? There is indeed a practical difference between these two approaches: May one bathe on Yom Tov using water heated before Yom Tov? Let me explain. Earlier, I mentioned the gezeiras merchatz banning bathing on Shabbos even with water heated before Shabbos, out of concern that the bathhouse attendants might desecrate Shabbos. Does the same concern exist on Yom Tov? The Ran (Beitzah 11a) explains that resolving this query depends on the dispute between Tosafos and the Rambam. According to Tosafos, heating bath water on Yom Tov violates Torah law; therefore, bathing on Yom Tov entails the same concerns as bathing on Shabbos. Just as Chazal banned bathing on Shabbos, they banned bathing on Yom Tov (Tosafos, Shabbos 40a s.v. lemotza’ei). However, according to the Rambam, since heating bath water on Yom Tov is itself prohibited only miderabbanan, there is no reason to prohibit bathing on Yom Tov using water heated before Yom Tov. Indeed, the Rif (Beitzah 11a) and other early authorities rule explicitly that one may bathe on Yom Tov using water heated from before Yom Tov. Thus, whether one may bathe on Yom Tov using water heated before Yom Tov is subject to dispute, the Rif and the Rambam permitting it, whereas Tosafos and others ban it. Since the Shulchan Aruch (511:2) rules like the Rif and the Rambam, a Sefardi may be lenient, whereas an Ashkenazi cannot be lenient, since the Rama rules like Tosafos. As I mentioned above, all authorities prohibit bathing on Yom Tov with water heated on Yom Tov, even if the water was heated automatically. Although the Rama concludes that one may not bathe on Yom Tov, even using water heated from before Yom Tov, halachic consensus permits washing one’s entire body this way, provided one does not do so all at one time (Rashba, Ritva and Ran to Shabbos 40a; Elyah Rabbah 511:1; Mishnah Berurah 511:15, 18). This is called washing eiver eiver, one limb at a time. Thus, theoretically, one may stand in a shower stall — not beneath the water flow — and place different parts of one’s body under the hot water, one after another. Ashkenazim may not stand directly under the water flow, because this washes most of one’s body at one time, but may splash water onto the body by hand. According to the approach accepted by the Sefardim, one may stand directly under the flow of hot water. 1. One must be certain that one is using only water heated before Yom Tov. As I mentioned above, all authorities prohibit bathing in water heated on Yom Tov, even if it was heated automatically. Furthermore, hot water generally mixes with cold water before emerging from the faucet. If the hot water heats the cold water to yad soledes bo (for these purposes, usually assumed to be 113 degrees Fahrenheit), this involves heating bath water on Yom Tov, which is prohibited; and furthermore, one may not bathe in this water. Thus, one would need to guarantee that mixed water does not heat to this temperature. Showering in a hotel or dormitory may be even more problematic, as most of these facilities use a coil system that heats the water as you turn on the faucet. This would be prohibited according to all opinions, because one is using water heated on Yom Tov and would involve a Torah prohibition according to Tosafos, since one is heating water to bathe one’s body. 2. Most North American household water heating systems operate with a boiler that automatically replaces hot water with cold, as you use it. This means that when one bathes or showers, one is heating cold water not for the purposes of Yom Tov use. There is a complicated rationale behind permitting heating of the new water. If the heating is indirect and unintentional, some permit it on Yom Tov (Tosafos, Beitzah 22a s.v. vehamistapeik; Shaar Hatziyun 514:31; however cf. Magen Avraham 514:5 and Mishnah Berurah 514:20. Also see dispute between Magen Avraham 314:5 and Terumas Hadeshen; see also Ritva, Eiruvin 88a). WHAT ABOUT A COLD BATH? According to what we have said until now, it should be permitted to take a cold shower or bath on Yom Tov. For that matter, what is wrong with taking a cold shower on Shabbos? Indeed, according to the conclusion of the Gemara, there is nothing wrong with bathing in cold water on Shabbos. However, early Ashkenazic poskim record a custom not to bathe in cold water on Shabbos due to a variety of reasons, including that one might carry (if one bathed outdoors in an area without an eruv) or squeeze water out of one’s hair or towel (Magen Avraham 326:8). This is established Ashkenazic custom: except for tevilah in a mikvah, one does not bathe on Shabbos. Sefardim never accepted this minhag, and may therefore take a lukewarm or cold bath or shower on Shabbos and certainly on Yom Tov. They should, of course, be careful not to squeeze out hair or a towel. Even following Ashkenazic practice, it is prohibited only to bathe all or most of one’s entire body, but one may wash less than half one’s body. WHAT ABOUT A COLD SHOWER? Even though Ashkenazim accepted the custom not to bathe in cold water on Shabbos, some poskim rule that the prohibition includes only bathing on Shabbos, but not showering. In truth, some of the reasons quoted by the Magen Avraham apply to cold showers also, since one might squeeze out one’s hair or the towel whether one is bathing or showering, whereas the other reason mentioned, that one might by mistake carry on Shabbos, applies only to someone who bathes outdoors, and applies less to someone who showers indoors. In his teshuvah on the subject, Rav Moshe Feinstein concludes that, although some authorities may permit cold showering on Shabbos, one should not follow this leniency, since it violates accepted practice (Shu’t Igros Moshe, Orach Chayim 4:75). However, one who is mitzta’eir may take a cold shower, since the custom mentioned by the Magen Avraham does not apply. Furthermore, Rav Moshe permits taking a cold shower on Shabbos during a heat wave (Shu’t Igros Moshe, Orach Chayim 4:74: rechitzah: 3). Certainly, one may be lenient to take a cold shower on Yom Tov when one is uncomfortable. One should be careful not to squeeze one’s hair or the towel. In practice, each person should discuss with his rav whether and how to take a hot shower on Yom Tov. Whatever your decision, I wish you all a happy, kosher, and comfortable Yom Tov. Posted on May 13, 2013 October 19, 2014 Author adminCategories Holidays, Shabbos, ShavuosTags showers on shabbos, showers on tom tovLeave a comment on May I Take a Nice Hot Shower on Yom Tov? I. What is the status of pareve food cooked in milchig or fleishig pots? II. The rules of pungent foods. III. Why we wait after eating fleishig before eating milchig. We will also acquire a glossary of several halachic terms, such as nat bar nat, davar charif, and eino ben yomo. I will explain each of these terms as we come to them. When the Torah prohibited eating meat cooked in milk, it also prohibited eating food that contains the flavors of both meat and dairy. For example, if one cooked meat and then dairy in the same pot on the same day, meat flavor goes into the dairy food – thus creating a prohibited mixture of meat and milk (Shulchan Aruch Yoreh Deah 93:1). To what extent did Chazal prohibit the mixture of milk and meat? Did they prohibit eating pareve food cooked in fleishig pots together with dairy? To answer this question, we need to be introduced to the concept called nat bar nat. The Gemara (Chullin 111b) states that, under certain circumstances, fish prepared in fleishig equipment may be eaten with dairy food. The poskim call this phenomenon nat bar nat, literally, a taste that is son of a taste. This means that since the meat taste has undergone two steps, first into the equipment (the first taste) and then back into the fish (the “son” of the taste), the residual “meat” taste is too insignificant to be considered meat. This rule also applies to the use of dairy equipment; that is, pareve food prepared in dairy equipment may be eaten with meat. Most Rishonim contend that food cooked in a meat pot may be eaten with dairy, provided the meat equipment was clean from significant meat residue. Following their approach, a pareve soup cooked in a clean fleishig pot may be eaten together with dairy foods even if the pot was used to cook meat immediately before the pareve soup. Similarly, if one cooked dairy, emptied out the pot, and then immediately cooked vegetables in the same pot using exclusively pareve ingredients, these vegetables may be eaten with meat. The Shulchan Aruch (Yoreh Deah 95:1) follows this position, and this is the accepted ruling among Sefardim. However, many authorities rule that this is permitted only after the fact, but that one may not cook vegetables in a fleishig pot intending to eat or serve it with milchig food and vice versa. Other authorities contend that nat bar nat applies only to pareve food placed in a kli sheni, that is, in a bowl in which hot meat had been placed after being removed from the fire. According to this approach, nat bar nat applies only if one cooked pareve food in a pareve pot and then emptied the very hot contents into a fleishig pot that was not heated or into fleishig serving vessels. However, fish or vegetables cooked in a pot in which meat was cooked the same day may not be eaten with dairy, nor can fish or vegetables cooked in a pot in which dairy was cooked the same day be eaten with meat (Rivan, quoted by Tosafos, Chullin 111b). The Rama (ad loc.) follows this approach, ruling that one should not eat pareve food cooked in a meat pot together with dairy, or pareve food cooked in a dairy pot together with meat. However, the Rama accepts that one may eat such fish or vegetables which were cooked in a dairy pot on fleishig dishes and with fleishig utensils, and that one may eat them before and after eating meat. He prohibits eating these vegetables only together with meat. This is the approach followed by Ashkenazim. A vessel that has not been used for hot food for more than 24 hours is called eino ben yomo, which I will translate as not used today. The authorities dispute whether one may lechatchilah cook pareve food in an eino ben yomo fleishig pot in order to eat it with milchig. According to what we have said so far, if Rachel already cooked her soup, she could serve it at a milchig meal, but not at the same time that she has milchig food on the table. If she is sfardi, then most authorities rule that she could even have milchig food on the table. However, it is important to note that many authorities rule that one may not plan one’s menu this way, and that the heter of nat bar nat is only after the fact. There is also another very important caveat that we will now explain – all this assumes that Rachel’s soup does not include any pungent ingredients that may already have become fleishig. There are several ramifications to this law of pungent foods, as we will soon see. The Gemara (Chullin 111b) prohibits eating dairy together with a radish sliced by a knife that had previously been used to cut meat, but permits eating bland food sliced by the same knife. Shulchan Aruch (Yoreh Deah 96:1) rules that the radish is fleishig, because the meat flavor absorbed into the knife transferred into the radish and is still considered a strong meat flavor. We do not consider the knife to be a nat bar nat, notwithstanding the fact that the flavor of the meat was first absorbed into the knife and only then transferred from the knife into the radish. The reason is that pungent foods, such as radishes, intensify flavor, causing the meat flavor in the radish to remain strong enough to still be considered meat. However, although one should not eat these pungent items together with dairy ingredients, they do not become so “meaty” as to require six hours after eating them. One should be careful not to eat them together with dairy, but one may eat dairy immediately after eating the onions or other pungent foods. Notwithstanding the fact that pareve food cooked in an eino ben yomo fleishig pot may be eaten with dairy, the Rama concludes that the lenience of eino ben yomo does not apply to pungent foods. Thus, someone who fried onions in an eino ben yomo fleishig pan must treat the onions as fleishig. You sliced an onion or a lemon with a fleishig knife. Since these items are pungent, they have absorbed enough meat flavor to be considered fleishig and cannot be mixed with dairy. From my experience, the most common type of kitchen mix-up involves the misuse of onions sliced with a fleishig or milchig knife. It is for this reason that I highly recommend a family kitchen policy of slicing all onions, lemons, radishes and garlic exclusively with pareve knives. At this point, I want to return to Rachel’s question: All that we permitted Rachel to do assumes that she did not use pungent ingredients, such as onions or garlic, in her soup. The answer is that if the pot in which the kugel was made was fleishig and ben yomo, then one should not eat the kugel at the same moment that one is eating actual dairy products, although one may eat it using dairy equipment. The answer is that what Mrs. Dwek is following a psak that, according to some authorities, is perfectly acceptable for Sfardim. An Askenazi should not do this lichatchilah. Either way, you may certainly trust her kashrus.